Iceberg dead ahead! That’s all that can be said about the upcoming immigration vote that is going down in flames. There is no rudder on this legislative ship that’s about to crash. There’s no starboard or hard to port. There’s no reverse. It’s a full-throttle charge into defeat. The impetus to bring this highly divisive issue being brought up so prominently during the midterm cycle (which is pure idiocy) is because a discharge petition heavily backed by Democrats would have allowed votes on immigration without going through the House leadership. They were three votes shy of successfully executing this effort; you need 218 signatories. To avoid this, a deal was struck to hold votes on a compromise bill, the Border Security and Immigration Reform Act, and the more conservative Securing America’s Future Act; Rep. Bob Goodlatte (R-VA), chair of the House Judiciary Committee, spearheaded the latter of these two bills. Both bills offer those enrolled in the constitutionally questionable Obama-era Deferred Action for Childhood Arrivals program protections from deportation. Goodlatte’s bill offers three-year renewable temporary protection status for roughly 800,000 people. The compromise offers six-year protections to 1.8 million people, with an avenue to green cards and eventually citizenship. The other differences you can read here. It’s a legislative disaster. The conservative bill failedlast week. And the vote counts for both bills have been dismal. Desperate to flip conservative votes, centrist House Republicans offered to add a controversial provision requiring the use of E-Verify, which mandates all companies certify the legal status of their workers. But it doesn’t look like it will be enough. “Without E-Verify in the bill, [some members] couldn’t get to ‘yes,’” said Rep. Jeff Duncan of South Carolina, one Freedom Caucus member who pushed for the mandate’s addition. However, asked if conservatives would back the bill if it’s added, he demurred. “We’ll see,” he said, adding that he also didn’t know yet how he would vote. Other Freedom Caucus members, including Reps. Dave Brat (R-Va.), Scott DesJarlais (R-Tenn.), Scott Perry (R-Pa.) and Jody Hice (R-Ga.), said they would still oppose the measure if E-Verify was included. The hard-line caucus debated the matter Monday night but was divided. GOP leaders added a massive infusion of low-skilled foreign workers to their immigration bill Tuesday, hoping to win over reluctant Republicans with business-friendly provisions. The proposal also includes a new guest-worker program for agriculture workers, hoping to appease farmers who fear they’ll lose their current, heavily illegal, workforce under the other provisions of the GOP’s compromise immigration bill. A vote is expected Wednesday, and GOP leaders were making a hard sell to members. “I want to lean into that vote and do as well as we possibly can on that vote,” House Speaker Paul D. Ryan said. But lawmakers are also beginning to think about what happens if the bill fails — an outcome analysts said is still likely. A more enforcement-heavy bill failed last week on a 231-193 vote. Moderate Republicans who thought the bill was too harsh, and conservatives who thought it too generous to illegal immigrants, joined all Democrats in opposition. The House had been poised to vote on the other “compromise” bill, written by moderates and conservatives, last week, but delayed the vote after it was clear the bill would fail. In the days since, both sides have tried to add sweeteners. In fact, Republicans are already considering their next move should the measure be defeated: a narrower measure addressing the family separation crisis at the border, which could see a vote later this week. Senate Republicans may also try to pass legislation this week amid the firestorm over migrant children being separated from their parents under President Donald Trump’s crackdown on illegal immigration. 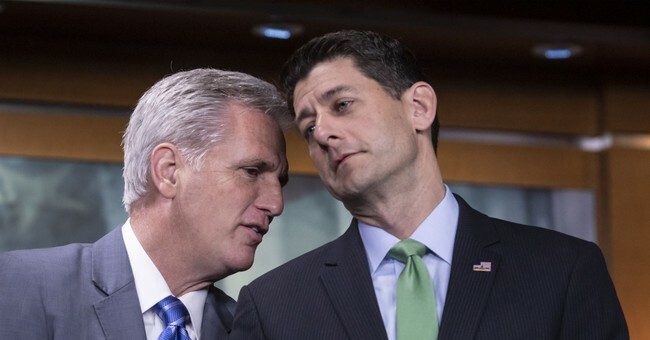 But first, House GOP lawmakers are still working to try to build support for a “compromise” immigration package that can win over conservative and moderate Republicans. Rank-and-file Republicans seemed confused about the status of the bill. Legislative text has not been released, and members weren’t able to say how they’d vote. House Majority Whip Steve Scalise (R-La.) said the vote was probably going to be held on Wednesday, though it hasn’t been scheduled yet. There’s a lot of talk, and no action. It’s a mess. It’s enlarged and magnified an issue that divides the party. We don’t need this right now, as the Trump White House continues to score wins in the economic and foreign policy realm. The economy is booming, tensions with North Korea have been reduced, wages are growing, and unemployment has reached historic lows. Immigration is an issue that can nuke the whole party. When the Democrats didn’t take the offer of border wall funding in exchange for legalizing 1.8 million illegals, that’s how you knew where the Left would behave on this issue. Poke, prod, divide, and let the GOP eat each other. That’s what’s happening here.